Mixed-media artist, Marita Dingus, will exhibit her most recent body of work at Seattle’s Traver Gallery beginning March 2. 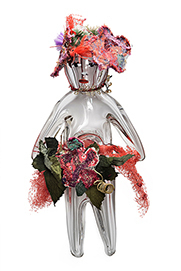 "The Gathering" will feature figurative sculptures made from discarded materials—an aesthetic for which Dingus has come to be known, but this exhibition will also include some of her largest-scale work to date. Dingus takes inspiration from African tribal art, particularly the bristly Nkondi sculptures of the Kongo people. Nkondi sculptures are anthropomorphic figures traditionally used to summon spirits for the purpose of correcting and healing social strife. In a telephone interview with the Glass Quarterly Hot Sheet, the artist explained why the figures hold special meaning for her, both artistically and personally. The artist finds these traditional forms to be especially relevant in today’s sociopolitical climate. 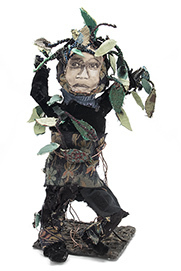 She hopes that, like the Nkondi figures, in trying circumstances her work can provide some solace and spiritual guidance. Dingus, who is herself of African descent, embraces Kongo folklore to buck what she believes to be misinformed presumptions by western media about African culture. Not only does Dingus reclaim traditional ideologies for her sculptures; she reclaims all of the materials, as well. The artist works with discarded, landfill-destined materials—mostly metal, non-recyclable plastics, and glass. Dingus uses that which would otherwise become trash, because the process is a manifestation of her belief that humans should be custodians of the earth. Like Dingus’s art, her interest in the environment and sustainability is, in part, inspired by her ancestry. Glass has unique significance in Dingus’s art, because the material’s inherent qualities are symbolic of the spiritual realm that she tries to tap into with her work. The relative physical permanence of glass is also appealing, especially in artistic exploration of ancestry and tradition. Glass, perhaps more than any other material, speaks to the theme of reclamation that so deeply informs Dingus’s art.